I intend to have our family menu plan ready to share on the first of each month. Today's the 2nd, so that's not too bad, right? I'm trying to learn how to imbed hyperlinks into graphics so that you can click on a date and see the recipe I'm using for that meal (if it's available online). Yes, I try to plan my menu's a month at a time. It's easier for me, and when I was working it was the only way I could get everything done. I try to do the bulk of my shopping at once (all non-perishable and frozen items) and then shop every other week for perishable items. Without any futher adu, here is this month's menu! I have 14 slips of paper with food categories on them (Mexican, Soup, Italian, New, etc). I also have a spreadsheet (compiled from several years of menu plans) that lists our favorite meals and what we've had that worked out well for us. Each of those meals have been categorized into the types mentioned above. The category of "New" is either a recipe I've been given, or one that we've found and would like to try. I draw a piece of paper, pick something from the category and write it in for the day. That piece of paper gets set aside until all 14 have been used. Then, they all go back into the bowl to re-select for the next 14 days, and so forth. Next month, I'll share how I handle doing the grocery shopping for everything and how I keep it all straight. What are your favorite meals to fix for your family, or to have? I like how I made number 11 happen. I think I will try to plan a month of meals this year but I'm not sure it's going to work with my family. It would be glorious if it did. Wow i love how you organize your meals! I am going to try this looking forward to reading about how you shop and organize! You are so smart to do a monthly menu plan. I have done this before and it really prevents us from doing take out or dining out too much because we always have our meals planned. Good luck. I am so impressed that you are so organized! I love your menu idea. We did this for several months last year and it really worked out well for us. Since I need to run to the grocery tomorrow I think I will work on a January menu as well. Thanks for the reminder. I like your idea too; I'm trying to get out of the "Tuesday is meatloaf" rut. Thanks for sharing! I plan meals for 2 weeks at a time, I shop weekly because I mostly use produce. Sometimes I write them in a journal. This year, I am going to do it with dinners. I habitually write down my toddler's lunches every morning to look back for ideas later. E loves chili, that recipe is on my FB page under notes. I cook so much different stuff, I'm not sure if we really have a favorite--corn chowder & biscuits comes to mind, we eat that year round. I LOVE this idea. LOVE it. What a great way to do it. Every new year's I swear I'm going to plan meals better and every day after work I am staring into the freezer. I did pretty good this past week, but I'm going to incorporate your idea. I always seem to forget some favorite meals after we haven't had them for awhile. That's awesome!! 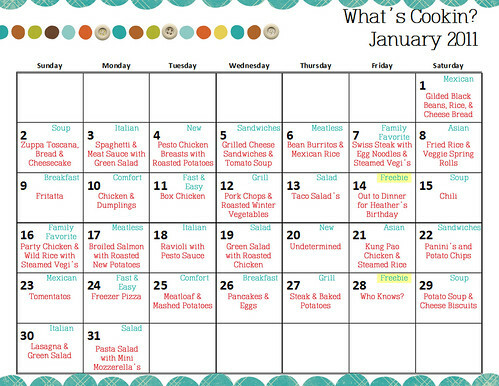 Currently I plan a weeks worth of meals, but I would be willing to try planning a month! Creative and cool companies sometimes give me stuff. I use it and then I write about it. If I was paid or compensated in some way, I will let you know at the beginning of the post. I am an Independent Distributor for Young Living Essential Oils. I am also an Amazon Affiliate.